Art Show Mircea Cantor: Q.E.D. MNAC / The National Museum of Contemporary Art in Bucharest proudly presents Mircea Cantor: Q.E.D., the first solo exhibition in Romania of one of the most important young artists to emerge on the international art scene over the last decade. Q.E.D. 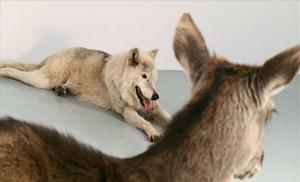 is the largest survey of Mircea Cantor’s practice to date, comprising 30 titles: photographs, videos, drawings and sculptures, from his 1999 The Origin of the World (After Courbet), a work that triggered Cantor’s expatriation to France, to the recent Sic Transit Gloria Mundi (2012), and to Business Class Worried (2013), especially created for this exhibition. Working with symbols in a symbolic building is the challenge on which this exhibition is premised. Exhibition areas that retain elements of the original decoration, and testify of the traumatic past of the building where the Museum is located, will host large-scale, catalytic works by Cantor: a gigantic wall-drawing in dynamite wire, whose ignition will be performed at the opening, or a life-size wooden sculpture representing a traditional house with scaffold-roof from the Maramures county in Northern Romania. The latter work, Threshold Resigned, oscillates poetically between the local and the universal, in tandem with interventions such as the DNA Kiss, overlooked by the ceiling work Ciel variable. Cantor orchestrates a complex discussion of displacement, fragility, certainty and anxiety, critically echoing the history of the building – The People’s House, for whose construction in the 1980s countless anonymous craftsmen, artisans and artists were employed to shape the monument of absolute Power. Sic Transit Gloria Mundi is a fusion between a Vanitas-like picture and a reflection on economic disparity. The film is displayed in dialogue with Holy Flowers (black-and-white photographs of Israeli machine guns, kaleidoscopically mirrored), and Fishing Fly (an airplane fashioned from recycled oil barrels, fitted with a golden hook). Cantor’s acclaimed Deeparture and Wind Orchestra share the preoccupation with the anxiety and sublimation of violence, with how violence can be metaphorically implied and politically instituted. The installation of the exhibition is geared to provoke (self-)reflection. Quod Erat Demonstrandum: Cantor’s self-ironic title counterbalances the artist’s ambition to create unique, universal works, to operate artistically within the domain of irrefutable statements. Works such as Unpredictable Future, All the Directions or Ciel variable reproduce this indecision between a transitive approach and the uncertainties of interpretation that arise when artistic statements meet their viewers. events and a rotating program of video works are scheduled for early September. The Guest Room, a space integrated in the exhibition, will host each month a work by an artist or an acquaintance Cantor shares affinities with: Rudolf Bone (April), Geta Brătescu (May), Gabriela Vanga (June), Ion Grigorescu (July), Corneliu Brudașcu and Andrei Șserban (August), Oanea Vasile and Ioan Opriș (September), Victor Man (October), Ciprian Mureșan and "All Clown Wanted" by Matei Vişniec, directed by Geo Balint, with Eliza Noemi Judeu, Nina Ionescu, and Adelaida Perjoiu (November), Adrian Gagiu (December), Victoria Berbecaru (January), Miklos Onucsan (February), Pavel & Tudor (March). Mircea Cantor was born in Romania in 1977. He lives and works “on earth”. His major solo exhibitions include Mircea Cantor, Centre Pompidou (2012); Sic Transit Gloria Mundi, MACRO Museo di Arte Contemporanea, Roma, (2012). More Cheeks Than Slaps, Le Crédac, France, (2011); Wise as a Serpent and Innocent as a Dove, Städtisches Museum Abteiberg, Monchengladbach, Germany, (2010). Mircea Cantor solo show, Kunsthaus Zürich, Zurich (2009), The Need for Uncertainty, Modern Art Oxford and Arnolfini, Bristol and Camden Arts Centre, London (2008-2009); Ciel Variable, Fonds Régional d´Art Contemporain Champagne Ardennes – FRAC, France (2007); The Title Is the Last Thing, Philadelphia Museum of Art, USA (2006). And group shows: Our Magic Hour – Yokohama Triennale, Yokohama, Japan (2011); Airs de Paris, Centre Pompidou, Paris (2007); and 4th Berlin Biennale (2006). He won the Marcel Duchamp Award, Paris in 2011 and the prize of the Fondation d'entreprise Ricard, Paris in 2004. Exhibition in the care of: Raluca Velisar and Mihai Pop. "Mircea Cantor: Q.E.D." Art Show in Bucharest. You can get here description, reviews, address, time and details of "Mircea Cantor: Q.E.D." Art Show in Bucharest. Visit Bucharest Tips for more Art Show events in Bucharest!